At Impact Trophies & Medals, we offer a huge range of ice skating trophies, medals and awards suited to any ice skating competition or event. 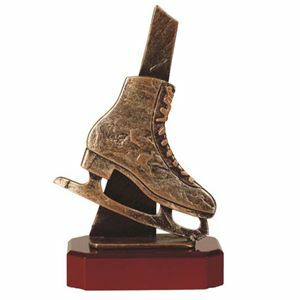 Our extensive range includes figure skating trophies, ice skate awards and premium handmade metal trophies for ice skating. Impact Trophies & Medals are a leading retailer of ice skating trophies & awards. Great for personalisation, many of our figure skating trophies and handmade ice skating awards can be personalised with a free self adhesive engraved text plate and printed logo insert, to perfectly meet all your ice skating presentation needs. 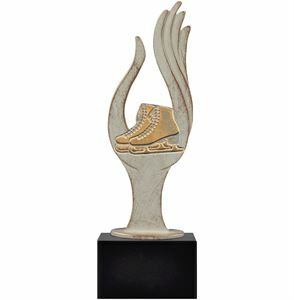 Designed to depict a flame and a hand, the White Flame Ice Skating Trophy cradles in the palm of a hand a pair of 2D ice skates. This beautiful award is forged from high grade pewter in Belgium, coated in gold and burnished in a white finish. The trophy is set on a wooden jet black plinth which can take a FREE personalised text plate. 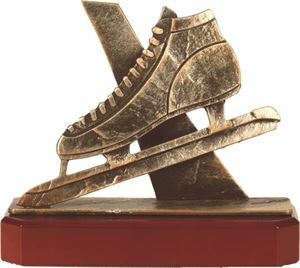 This detailed award showcases a 2D solid pewter ice skate, crafted onto an upright plaque and set upon a wooden plinth. 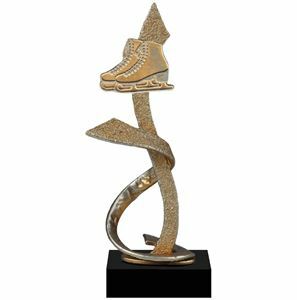 The Ice Skating Boot Trophy is made in Belgium from quality materials and can be personalised with a bespoke engraved plate. This tall elegant award is sure to make an impact at your next ice skating presentation. Presented on a square black base, the award features two hoops supported by slim vertical posts, finished in a white and gold washed effect. 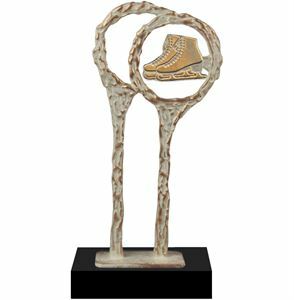 A golden embossed motif of a pair of ice skating boots sits inside the right hand hoop, creating an eye catching trophy. The High Rings Ice Skating Pewter Trophy is produced in Belgium and can be purchased in a choice of 3 sizes. Presented on a polished black rectangular plinth, the Axel Ice Skating Pewter Trophy showcases a modern award consisting of ribbons of golden, textured metal, twisted to create an eye catching display. Crafted from quality pewter, the trophy features an embossed motif of a pair of ice skates set at the top. This striking award would make an exceptional prize to recognise outstanding ice skating achievements. The perfect award for any prestigious ice skating event, this Belgium made trophy has been cast from finest pewter and finished in gold with a burnished blue bronze effect. The Retro Ice Skating Trophy displays a set of ice skates positioned near the top of the stylish retro shapes. The trophy is mounted on a polished black wooden base which can take a FREE personalised text plate. 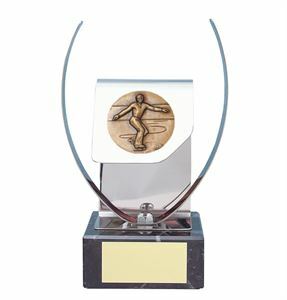 The antique bronze effect Speed Skating Pewter Trophy is supplied on a polished wooden base. 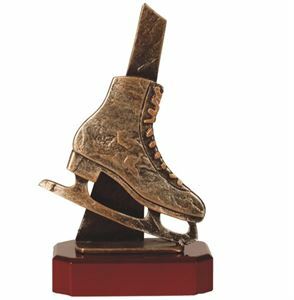 The trophy features a speed skating boot positioned at an attractive angle, displaying neat detailing. Made from quality pewter, the award is finished with a bronze glaze. This beautiful award exudes sophistication and elegance, perfectly reflecting the grace of an ice skater. 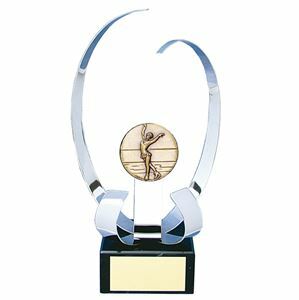 Cast from highly polished ribbons of softly curved silver metal, the trophy frames a gold circular disc bearing the image of a female ice skater. Presented on a premium black marble plinth, the Female Ice Skating Mystique Handmade Metal Trophy has been crafted by hand in Spain and may be personalised to add a special touch. Elegantly handcrafted by the most creative and skilled of trophy makers in Spain, the Male Ice Skating Harmony Handmade Metal Trophy features a gleaming silver metal curved sheet framed by two curved metal strips. A gold metallic circular motif shows a male ice skater. 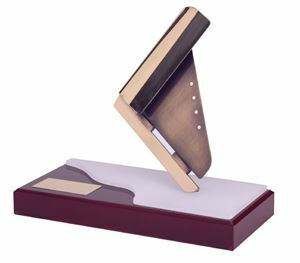 This stylish award is mounted on a solid black marble base which can be personalised to your requirements with a FREE text plate. 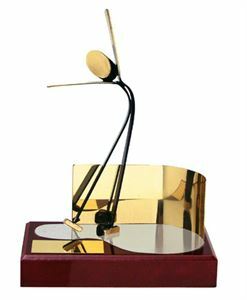 From the popular Designer European Awards range, this modern style trophy features a handmade metal figure positioned in an ice skating pose on top of a black marble block. The Ice Skating Blue Figure Handmade Metal Trophy is finished in a blue oxide glaze with polished gold highlights. This modern style award is handmade from quality metal in Barcelona, Spain. 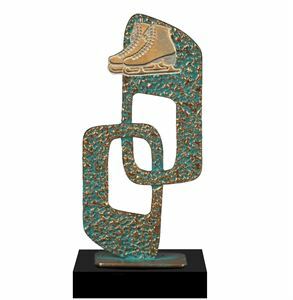 The Ice Skating Boot Handmade Metal Trophy features a 2D ice skate made from 3 colours of metal, detailed with eyelet holes. The skate is positioned on its toe on a highly polished wooden plinth, partly covered in a white acrylic coating to represent ice.